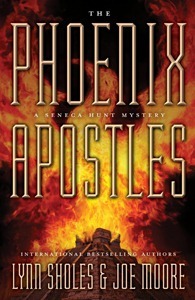 Last week, my publisher sent over the final cover design for my new thriller THE PHOENIX APOSTLES (written with Lynn Sholes) which is scheduled for release in June, 2011. The title—the first one our publisher accepted with no change—refers to a group of followers of a religions cult that believes the only way to save the world from the predicted end of mankind is to appease the gods using the same technique as the Aztecs: human sacrifice. Or more specific, the ripping out of a human heart while the victim is still alive. Those are the “apostles” referred to in the title. The phoenix portion comes from the name of the group itself: The Phoenix Ministry, of which their logo is the mythical phoenix bird rising from its own ashes. The cover consists of two main elements: the phoenix bird aflame shooting out of an Aztec pyramid, both of which go along with the plot of the story. Although the back cover text has not been finalized, here’s the gist of the what it will say. At a dig site in Mexico City, magazine journalist Seneca Hunt is reporting on the opening of Montezuma’s tomb when it’s discovered that the remains of the Aztec emperor are missing. Before she can investigate further, what appears to be a terrorist attack kills the dig team including her fiancé. Seneca barely escapes the carnage not knowing that a passing glimpse of an out-of-place object in the tomb may have sealed her fate. She soon learns that someone is stealing the burial remains of the most infamous mass murderers in history. Seeing a story in the making, her research uncovers a plot to slaughter millions in the name of an ancient cult. Seneca teams up with a bestselling novelist to prove the threat really exists while staying one step ahead of those who want her dead. As time is running out, she must follow a 2000-year-old trail leading back to the death of Jesus Christ. "Bold, taut, and masterfully told." You can read their complete quotes by clicking here. So now that you’ve seen the cover and know a little bit about the story, would it grab your attention if you saw it in your favorite bookstore? Would it make you want to read the book? Please be honest and share your opinion. Thanks.